It’s been QUITE a while since we had a News Jagoff!!! And THIS story is basically a trifecta! The guy who escaped from the jail cell… the guy that gave the escapee shoes vs. calling the police… and the guy that WPXI’s Cara Sapida interviews in the Washington County bar! But for the sake of this post, let’s key on Timmy. Ya see, Tim got arrested by Smith Township police the other night and then somehow escaped from his cell. Did he run for the Canadian border? No. Did he run for the Mexican Border? Nope! Did he run to go find a secret tree in a cemetery where he had hidden hundreds of thousands of dollars 10 years ago? Nah! He ran to the local bar to have a beer (with ZERO money by the way). And, after telling the bar customers that he just escaped from jail and HAD zero money, one of the locals buys him a beer!!! LOL!!!!!!!!!!!!! Really.. that is LOL!!!!!!!!!!!! 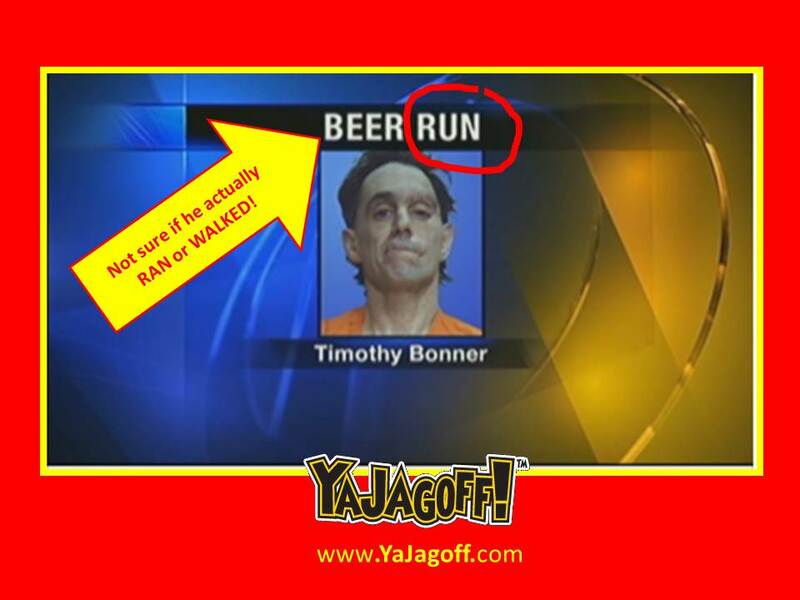 ESCPECIALLY if you watch the video of the guy in the bar tell the story on WPXI. Hey Timmy….. we guess you’re not really an “escape artist” artist per se….you’re more of a GET OUT OF JAIL artist… cuz the whole “escaping” thing (meaning run far, far, far away once you get away from the police) seems to be the part you have yet to master!!! Here’s a thought for the next time….run into the bar.. tell them your today’s DESIGNATED DRIVER and get yourself one of those cool wristbands. Then, offer some drunk dude a ride home and, once you drop him off…….put the pedal to the metal and head for hills!!! In the meantime, in the words of the Monopoly Man.. “GO TO JAIL! DO NOT PASS GO AND, BY ALL MEANS DO NOT PASS-UP ANY BARS! GO DIRECTLY BACK TO JAIL, Ya Jagoff!!! LOL! Your description is perfect!